Sam is the first of the last 13 Dreamers to be revealed. Caught in a covert battle to preserve life as we know it, he must follow the clues to find twelve more Dreamers. Only this unique group can unravel the mysteries of an ancient prophecy and locate the long-lost key to Earth's survival. Sam must not only face two competing factions-The Enterprise and The Academy-but also elude the menacing presence of the masked figure, Solaris, who is always lurking in both dreams and reality. The last 13 Dreamers are always in danger. The group must avoid capture by trained Agents and unscrupulous treasure hunters, as well as thwart security officials as they gain access to museums, libraries, government facilities and archaeological sites, in order to locate the lost pieces of the artifact that will lead them to their ultimate destination. 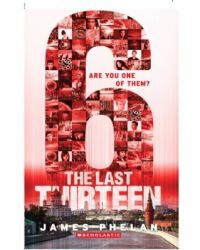 The last 13 must continue on their desperate mission against the odds and face the inevitable final battle. Will they be strong enough to fulfil the prophecy, or is the world doomed? 6 I don't know what's real and what's not anymore. The line between dreams and reality continues to blur as Sam is drawn into an age-old battle for Dreamscape. Adding to his confusion, the eighth Dreamer already seems to be aware of the importance of her dreams and the search for the Gears. From the Kremlin in Moscow to the wilds of Siberia, Sam is involved in a race-within-the-race with an old adversary who has discovered a sinister way of staying one step ahead. The more Sam and his friends dream, the less they will remember... Sam must find the last 13. Our fate lies with them alone. This series needs to be read in order starting with book titled "13" and ending with book titled "1".